With better fuel, you can become more efficient in your farming or construction uses, while helping the environment. 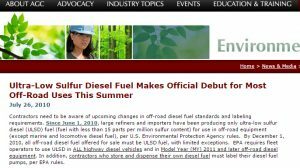 The greater fuel efficiency experienced with diesel fueling has brought more uses for the ULSD fuel in various off road applications. CAT and John Deere equipment can have longer life expectancies by using ULSD fuel since the high energy amount per gallon means that there will be less wear on the engine for an extended time. At Berico Fuels, we make it easy to get your tanks refilled so you can work efficiently. At Berico Fuels, we provide ULSD fuel, as well as gasoline, #2 heating oil, propane and kerosene to help our customers get the fuel they need for their equipment. Seven days a week, we provide competitively-priced options for diesel fueling and other fuels for various uses, such as convenience stores, farming, construction and other applications. At Berico Fuels, we can check to make sure the farm equipment or construction vehicle that you use is compatible with the type of fuel that you need for off road diesel fueling. Our expertise in available fuels and current equipment will help you to locate exactly what you need to stay energy efficient and extend the life of your equipment. Contact us to find out more information on our commercial fueling solutions: 336-496-2509.